Do you love the smell of books? Do you prefer the feel of paper? Do you feel slightly superior to others because you paid for the hardcover? Do you grasp at any excuse to deride e-books and the people who read them? Well, I have found the article for you! Recently on Mental Floss an article entitled “5 Reasons Physical Books Might Be Better Than E-Books” sought to comfort snooty readers who wanted ammunition to fling at e-book readers. In the proud tradition of deriding any new technology as bad (see e-books, e-cars, driverless cars, etc), this article introduces us to some research that is wonderfully out of context for the intent of the article’s argument. Let’s dig in. Though e-book readers have become a more common sight around town, traditional books still have their evangelists. According to The New York Times, e-book sales have been falling in 2015. Print definitely isn’t dead. In fact, according to some research, it may actually be a better choice for some readers. 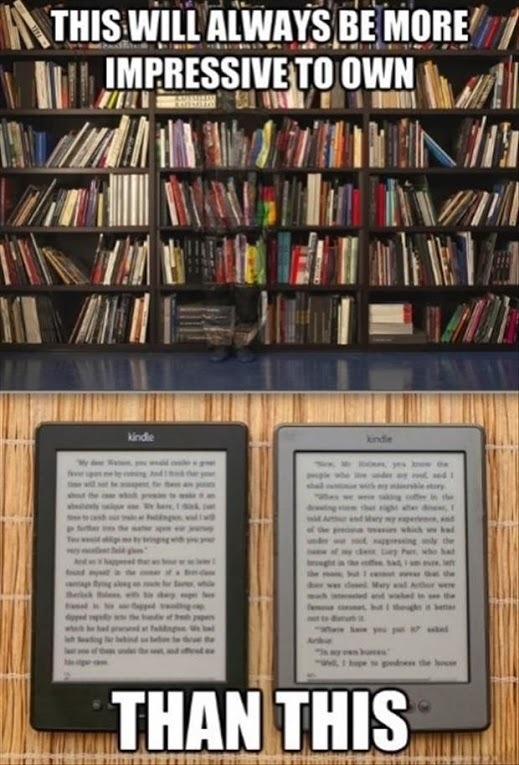 While scientists are still trying to tease out exactly how digital reading affects us differently, here are five ways e-books might be inferior to their dead-tree cousins. 1. E-BOOKS CAN REDUCE READING COMPREHENSION. In a study of middle schoolers, West Chester University researchers found that students who read on iPads had lower reading comprehension than when they read traditional printed books. They discovered that the kids sometimes skipped text in favor of interactive features in the e-books, suggesting that certain multimedia in children’s e-books can be detrimental to the practice of reading itself. However, the researchers noted that some interactive features in e-books are designed to enhance comprehension, and that those might be more helpful than game-type interactive graphics. This is a fantastic study in how multitasking is terrible for concentration and thus impacts reading comprehension. iPads have all sorts of cool stuff on them, including little notifications telling you that your friend just liked your latest picture of your meal. And building those distractions into the book being read: sounds like a great idea! What this study doesn’t do is support the idea that e-books reduce reading comprehension. 2. YOUNG KIDS CAN GET DISTRACTED BY E-BOOKS. Similar results were found by a small study by the Joan Ganz Cooney Center that consisted of 32 kids reading e-books and print books with their parents. It found that “enhanced” e-books might be distracting. Kids who read enhanced e-books—ones with interactive, multimedia experiences—were more engaged with them physically, but in the end they remembered fewer narrative details than those who read print books or basic e-books [PDF]. Don’t read the link. Don’t read the link. You read the link: didn’t you. Leaving aside the tiny study size for a moment (a point the study authors acknowledge), the study itself supports the points I made above about being distracted whilst reading. And if you look through the study you see a great little chart that showed the comparison of reading comprehension – expressed as story details recalled – was actually superior in basic e-books than in print books or enhanced e-books. 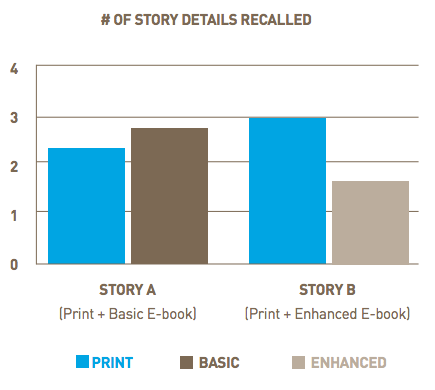 The enhanced e-book was less effective than the print and basic e-book in supporting the benefits of co-reading because it prompted more non-content related interactions. 3. YOU REMEMBER LESS ABOUT A BOOK’S TIMELINE. Another study of adults also found that e-books can be hard to absorb. The researchers asked 25 people read a 28-page story on a Kindle and 25 to read the story in paperback, then asked the readers to put 14 events from the story in chronological order. Those who read the story on a Kindle performed worse on the chronology test than the book readers, though they performed about the same as print readers in other tests. Earlier research by the same scholars, from Stavanger University in Norway, found that Norwegian 10th graders also remembered more about texts if they read them in print rather than on a computer screen [PDF]. I’d link to the original paper, but it is behind a paywall. Suffice to say that the error margins were pretty big (even the paper readers got 34% of the plot points in the wrong order). And this was a short story, something that shouldn’t be that difficult for any reader. So this probably says as much about the story as anything. They’d need far more stories and participants to get a good idea of what is going on. But I will concede that reading on paper vs e-reader vs screen is definitely a different experience and has an influence. What that influence is, positive, negative, or just different, needs more research. Interestingly the study of reading PDF texts on a screen vs paper texts in high school students showed why scrolling is a terrible way to read anything. Scroll down to read more about PDFs sucking. 4. THEY’RE NOT GREAT AS TEXTBOOKS. While e-book textbooks are often cheaper (and easier to carry) than traditional door-stop textbooks, college students often don’t prefer them. In some surveys of college kids, the majority of students have reported preferring print books. However, a 2012 study from the UK’s National Literacy Trust of kids ages 8 to 16 found that more than 50 percent of children reported preferring screen reading [PDF]. It is odd to start a point and then go on to disprove it. E-book textbooks being cheaper, easier to carry, and in some surveys preferred by the majority of respondents, seems to me to be the opposite of “not great”. The preference for paper textbooks claim comes from a survey of 527 students, yet is immediately refuted by the UK survey of 34,910 students. I wonder which one is more representative of how students feel about textbooks? In the comments of the Mental Floss article, someone made a good point in regard to the format of textbooks. Oftentimes the textbooks are PDFs, which brings us back to the point about scrolling, and adds the problem with taking notes. Clearly the format of the e-book plays a big part in how people feel about them. Staring at a lit screen can be tiring for the eyes and the brain. A 2005 study from Sweden found that reading digitally required a higher cognitive workload than reading on paper. Furthermore, staring at LED screens at night can disrupt sleep patterns. A 2014 Harvard study found that people who used e-readers with LED screens at night slept worse and were more tired the next day. So, if you’re going to go for an e-book, go for one without the backlight. Now let us talk about how bad e-books are for your brain…. Sorry, did I say e-books when I meant LED screens like your iPad and computer? Silly me. Having bright light, especially from white background screens, shining in your eyes at night isn’t a good thing. But that is about as related to e-books as X-Factor is to talented singers. So the message about changing your screen setup for night viewing only really applies to readers if they utilise a backlit screen for reading. BUT DON’T THROW AWAY YOUR E-READER JUST YET. However, all this may not mean that reading on a Kindle is really going to melt your brain. For instance, reading an e-book on a computer is a much different experience than reading on a Kindle, which is specifically designed for consuming books. So, too, is playing with an interactive e-book on an iPad, compared to using a simpler e-book device that only presents the text, with no opportunities to click away into digital distractions. This really does appear to be information that would have been better presented in the context of the “e-books are evil” points above; doesn’t it. Throwing in this sort of context at the end rather than in the discussion of the study findings is a cheap tactic, a ploy that sees important information left until after you have already formed your opinion on a subject, or just plain stopped reading the article. This information has far less chance of being retained than the others points made earlier in the article, thus the article has created the bias they were after (deliberately or otherwise). And some studies have found that part of the difference between the way people absorb information from e-books versus paper might be due to approaching e-books differently—in one test, participants didn’t regulate their study time with digital books like they did with paper texts, leading to worse performances. It’s possible that our expectations of e-book reading—as well as the different designs of the digital reading experience on a computer or iPad or Kindle—might affect how we approach the text and how much effort we put into studying them. As generations of e-book readers evolve, and people become more accustomed to the idea of sitting down with a digital textbook, these factors could change—for better or for worse. These are all good points, again made at the end of the article rather than at least being hinted at throughout. And unlike the main points in the article, these are unreferenced. Are these points from the studies already referenced (some are) or some other studies that aren’t worth mentioning? In the former, you would expect these points to have been raised earlier in the article in the proper context, in the latter, this feels like an attempt to downplay the statements as less important than the referenced points above. Either way we are left with the sentiment “change is scary” rather than “change is change”. Hopefully this breakdown of the Mental Floss article shows just how disingenuous many of these anti-technology articles are, especially the “e-books are evil” articles. I’m not trying to say that e-books are what everyone should be reading, or that our forests are now saved from Dan Brown. There is clear evidence that our changing technology is changing the way we read and absorb information, and this transition period is still a learning phase as to how and if we will change our reading preferences. But negative preconceived ideas about e-books (or technology) don’t help in communicating about the change that is happening. Update: This study compared reading on paper and screens and found stark differences. The sample size was again small, but the study appears to have been better conducted than the others I’ve discussed above. The conclusions from the paper suggest, as I have, that we need to look at teaching/learning how to read e-books and utilise e-readers. To sum up, the consistent screen inferiority in performance and overconfidence can be overcome by simple methods, such as experience with task and guidance for in-depth processing, to the extent of being as good as learning on paper. Previous Previous post: Book vs Movie: V For Vendetta – What’s the difference?